Overall size: 37" x 27"
During late 1943, America’s airpower was beginning to turn the tide against our Axis enemies. The Army Air Corps and the U.S. Navy strengthened their air forces with newly designed and improved aircraft, and Southern California became a major aircraft-manufacturing hub. At its Mines Field plant, North American Aviation produced the superlative P-51B Mustang at the incredible rate of 24 aircraft per day. 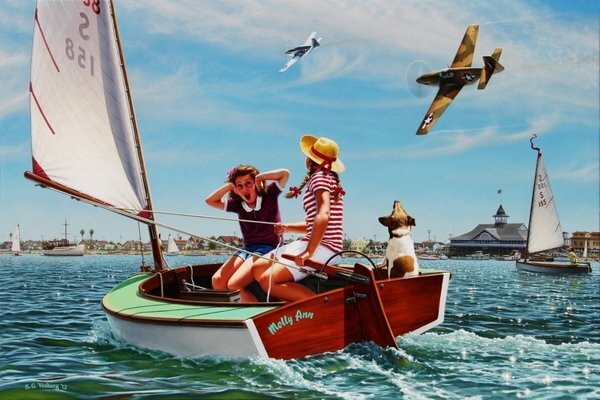 Along the shores of Orange County, fighter pilots often flew factory check flights, sometimes flying near civilian populations, as seen in this depiction of a pair of Mustangs “buzzing” Newport Bay. Fearing a Japanese invasion, sailing along the west coast on the open ocean was prohibited. The U.S. Navy sealing the coastal waters for pleasure boating, inner harbors became the playground of youthful sailors, paddle boarders, and sun seekers. 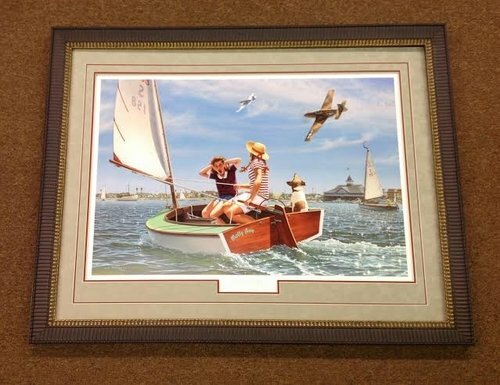 The bay was often alive with numerous, small catboats called “snowbirds.” Children and teenagers learned to sail on these protected waters throughout World War II, and great regattas called the "Flight of the Snowbirds" were held on the bay with hundreds of snowbirds racing up and down the harbor. Signed by the artist.